Are you someone who usually throws out the spatulas and little 'extras' that come with a skincare product. With this, don't you dare! 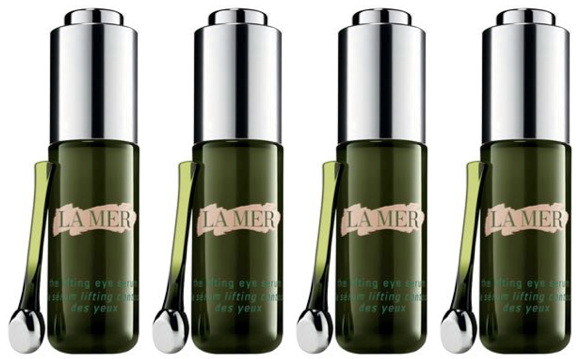 Long, long after we've finished this glass dropper bottle of the new Crème de la Mer eye serum (designed for sagging, bagging and fine-lined eyes), we'll be be hanging on to the little silver-tipped, flat-sided, drumstick that comes with it. The serum itself is great: smoothing, cooling, non-irritating (a must for us, as we're seriously sensitive-eyed). If you want the science bit, it features a 'new interlaced Stretch Matrix Complex... to help visibly support the “architecture” of the eye and brow area'. Sea botanicals also feature (as you'd expect from Crème de la Mer), to promote elastin production, along with a 'triple concentration' of their signature Miracle Broth. But it's the tool which makes the investment (and it really is a skin-vestment) worth contemplating, and which works to turbo-charge the action of the serum. Physical action is brilliant for the eye zone; it smooths away puffiness and ensures the product's perfectly spread. And this definitely does that trick. Brilliantly. Now, this isn't in any way budget-priced. (In fact, you probably wouldn't even think of splashing out this much on an eye product if you're not also driving a Mercedes-Benz and have a pool.) Heck, it's not even a complete eye treatment: just designed to be layered underneath your regular eye de-ager. But that silver-topped drumstick? Worth its weight in gold , nonetheless. Did you know Liz Earle's now designing Fairtrade jewellery...?